One of the greatest aspects of world travel (or even traveling domestically/regionally/locally) is the discovery of new foods. Even better is choosing to prepare these dishes, enjoy them post-travels and allow your taste-buds to trigger memories of those adventures you just recently enjoyed. For me, Spain was the first time I left the comfort of the mother land, the first time I found myself surrounded by the unknown. And subsequently, the first time I had a Spanish style tortilla. 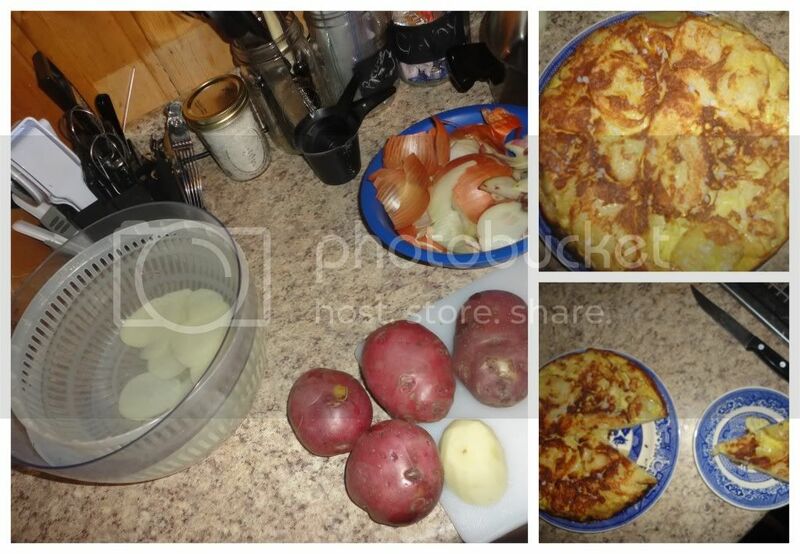 Considering the ridiculous amount of potatoes and onions we've had in our pantry, I figured a quick and easy meal that would also take me on a trip to one of my first country-lovers, would be a Spanish Tortilla. Peel and thinly slice 5-6 medium Red Potatoes, throw in a bowl of water with a dash of lemon juice to prevent browning. Peel and thinly slice 1 Onion. In a large bowl, whisk together 6 Eggs, season with salt and pepper. Stir the potatoes and onions into the eggs, let set for 25-20 minutes. Heat 1/4-1/2 cup of Olive Oil in a cast iron (or specialized tortilla pan) and pour in the egg mixture...and now things get tricky and I am no expert (may you want to refer to the two referenced recipes at this time). Anyway, let it cook long enough to set throughout the bottom half but not so long as to burn it...I burned mine a little bit... Flip and cook the other side. Serve warm or at room temperature. May serve with hot sauce, chopped tomatoes, a drizzle of olive oil or sea salt (or any combination thereof). Enjoy!